Dr. Brian Mitchell | Cherokee Co N.C.
MURPHY, N.C. – A request for funding was made by the Hiwassee Valley Recreation Foundation to the Murphy City Council at the council’s Monday, April 2, meeting. Representing the Foundation was Dr. Brian Mitchell and Ralph Robinson, director and operator of the Hiwassee Valley Pool and Wellness Center. Mitchell requested an annual financial subsidy in the amount of $45,000 from the city of Murphy to support operations at the wellness center. According to Mitchell, operation costs for the wellness center is between $350,000 and $400,000 each year and the foundation has contributed over $150,000 since 2015 to support operations for the center. Mitchell also said currently, the foundation’s fund balance stands at $35,000. Since then, Robinson stated membership had spiked as high as 1,200 and now stands at around 1,000. Robinson also stated some members had told him that they had moved to the Murphy area because of the accessibility of the wellness center. “Speaking for myself, it’s a great – it’s an awesome – asset,” Ramsey said. “And having that kind of facility in rural Appalachia, where we are, is really a great asset for our area,” Robinson agreed. Robinson stated additional programs and amenities are being added to the center or will be added in the near future. He also said the center’s goal for membership is 2,000. Robinson said the center is currently offering 40 percent off of one-year memberships in celebration of the reopening of the pool. During the discussion, the mayor and council offered several advertising ideas for the wellness center, including utilizing a large exterior wall space on the center itself to hang an advertising banner to attract motorists on Valley River Avenue. Mayor Ramsey suggested to Robinson a possible advertising campaign to attract out-of-town fitness enthusiasts visiting the area who might need a place to maintain daily exercise routines. Ultimately, the council made no decision and told Mitchell and Robinson the council would consider the funding request. A resolution was passed by the council to proceed with steps to make the city council non-partisan in elections in time for the November general election. Councilman Barry McClure explained the Murphy City Council is one of only eight remaining partisan city councils out of 533 in the state of North Carolina. 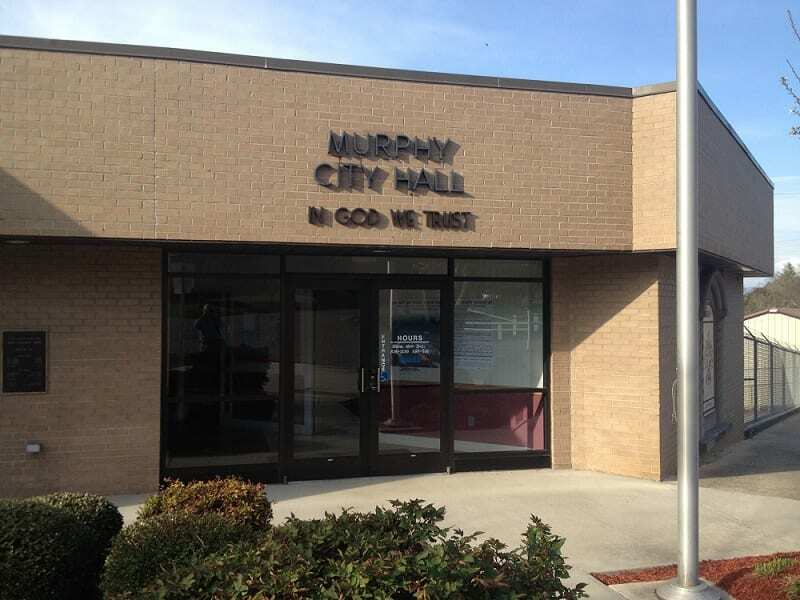 McClure also stated the majority of registered voters in the town of Murphy are non-partisan (415) as opposed to 392 registered Democrats and 389 registered Republicans. According to McClure, a non-partisan council would save the county a considerable amount of money by eliminating the need for a primary election. After the resolution passed, City Attorney Ronald Cowan explained the resolution schedules a public hearing at next month’s meeting for citizens to voice any concerns about or to contest the potential change. Several representatives from the Murphy Business Association were on hand to request a downtown street closure to accommodate the upcoming Murphy Spring Festival to be held Saturday, May 5. The closure, which the council unanimously approved, will close a portion of Tennessee Street from Valley River Avenue to Depot Street to vehicles between the hours of 5 a.m. to 7 p.m. on the day of the festival. A speed limit ordinance was also approved for a small portion of state Route 1556 (Martins Creek Road) from beginning of the city limits to the intersection with Hiwassee Street. The ordinance sets the speed limit at 25 mph. A budget amendment to purchase a new police vehicle was approved. Simons explained the new purchase will not add a vehicle to the city police fleet but will instead replace a vehicle that was lost in a previous accident. According to Simons, the amendment is an $11,000 increase to the miscellaneous line item appropriation and a $21,300 increase to general fund balance appropriation.